We are not allowed to register the death on your behalf. To view a list of local registrars please go to our 'Useful Contacts' section. You should register the death within five days at the Registrar of Births, Deaths and Marriages for the district in which the death occurred. Please contact us, and we will advise you regarding the location of the Registrar’s office, their opening times and how to make an appointment. ü A Certificate of Registration, or Notification of Death (free of charge) – for you to send to the Department for Work and Pensions (DWP) with any pension or allowance books. This service makes things a little easier when you are coping with a death. The Tell Us Once team will notify all participating government departments and organisations of the death. This includes council housing, adult services, income support, libraries, driver and vehicle licensing agencies and passport services. This will save you numerous calls and letters to each individual department. When you register the death the Registration service will register you onto the free Tell Us Once Service. You will receive a letter with a reference number and instructions on how to use the service. It is not essential to do this straight away; but it’s advisable to do this within a week of making the registration. You’ll need to gather some documents and information then go online or call 0800 085 7308. 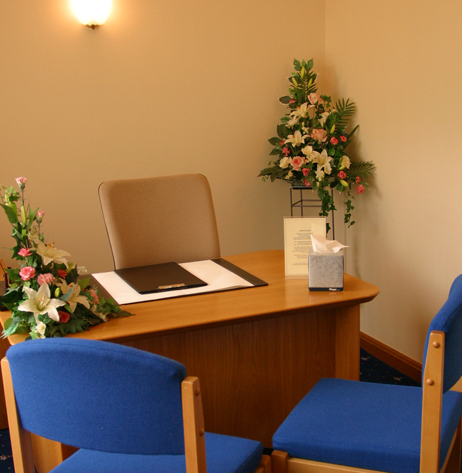 You will need to answer questions relating to organisations that the deceased had contact with. Tell Us Once will then notify those departments and they will amend their records. Where a death from natural causes occurs in England and Wales and the principal Informant lives a distance from the Registration district in which the death must be registered, it is permissible for the registration to take place ‘By Declaration’ at a convenient registry office within England and Wales. Before using this procedure the Informant should contact the Registry office nearest to where the death occurred (‘Registrar A’) for guidance and clearance. The informant then makes an appointment with the convenient Registry office (‘Registrar B’) and attends with the necessary information and the ‘Medical Certificate of Cause of Death’ issued by the doctor. As this certificate is normally located at the place of death it must either be forwarded to the Informant or it can be handed to the Registrar A who can fax it to Registrar B (in the interests of security a fax can only be accepted if sent from Registrar A to Registrar B). If the Coroner is involved, the form that replaces the doctor’s Medial Certificate must be faxed instead from Registrar A. Once the above certification or fax has been received by Registrar B and the declaration has been made by the Informant, the document(s) will be sent by first class post to Registrar A who will register the death and dispatch, by return first class post, the Green Certificate (if applicable): the DWP form, and the Certified Copies of an Entry of Death, if paid for. Whilst the procedure may be more convenient for the Informant, it will result in an additional delay before the funeral takes place. A return journey to Registrar A may be well worthwhile to avoid unnecessary hold-up.